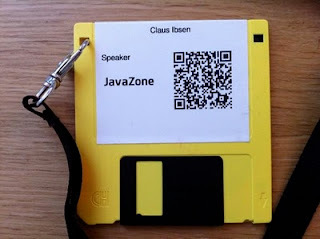 In my previous blog covering my impressions from the recent JavaZone conference I forgot to tell you about the cool badges used. Its a 3.5 inch floppy disk. The speakers had yellow disks, and attendees black. At the JavaBin stand (the organizers) there was an old computer with a disk drive. There was a rumor about a lottery, so by inserting the disk you were told if you won or not. The computer told me that I was a looser, using old scholl ASCII arts. This reminds me back in the good old Amiga days with the demo scene and whatnot.